Some while ago, March 2008 to be precise, we made note of a new chapel which had been constructed at St. Anthony's High School in South Huntington, New York. We are very pleased to be able to follow that up now with some photographs of the completed chapel -- thanks in great part to our friends at the journal Sacred Architecture who put us into contact with the appropriate people at St. Anthony's. By way of a preface, the mention of a high school chapel likely excites little in the imagination of many. Indeed, one would probably not be out of sorts to expect something of a rather modest (if not a functionalist-minimalist) nature, curtailed either by rather limited means or by rather limiting priorities. But such is not the case here. In point of fact, what we see is a design which builds a chapel of no little note; one which many of us would be delighted to have as a parish church and which, in my estimation, excels over and above the architecture and art of many a typical parish church indeed. We are presented with a chapel clearly designed in continuity with our tradition and which also includes elements of an "Other Modern"; a chapel which further employs qualitative materials and original craftsmanship and artistry. A chapel which can be clearly understood as manifesting a noble beauty, well suited to the spirit of the Roman liturgy. The overall architectural vision and direction for the chapel was set by the principal of St. Anthony's, Br. 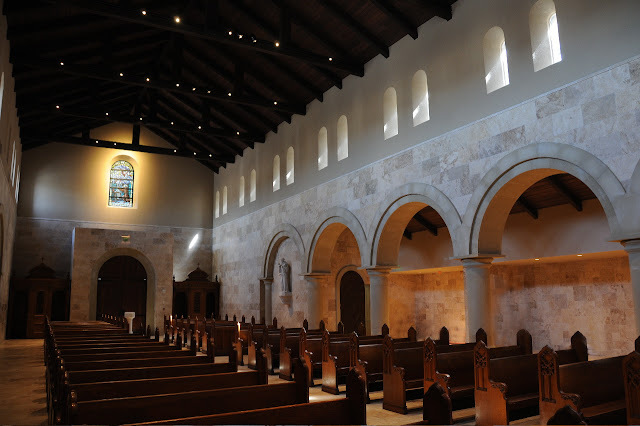 Gary Cregan, OSF, who was inspired by the Fuentiduena Chapel, which now forms a part of the Cloisters Museum in New York City. 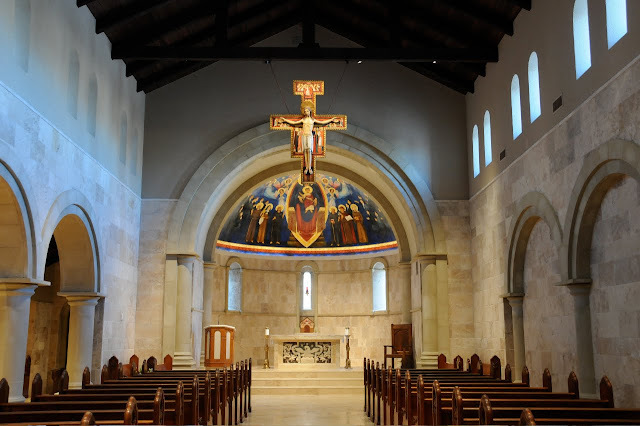 A particularly remarkable and noteworthy aspect of the chapel is the apse fresco which not only brings an immense visual and architectural impact, but which was also designed and executed by an art teacher of St. Anthony's, Jennifer Baldwin-Schafer, and approximately seventy of her own art students. The stone on the walls is a pale, warmly colored limestone from the Middle East and the floors are constructed of marble. Do also take note of the roof. A view looking back toward the narthex. You will note the traditional confessionals to either side of the door. The design on the face of the altar is marble coming from the 16th century, purchased from a closed church in Viterbo, outside of Rome. 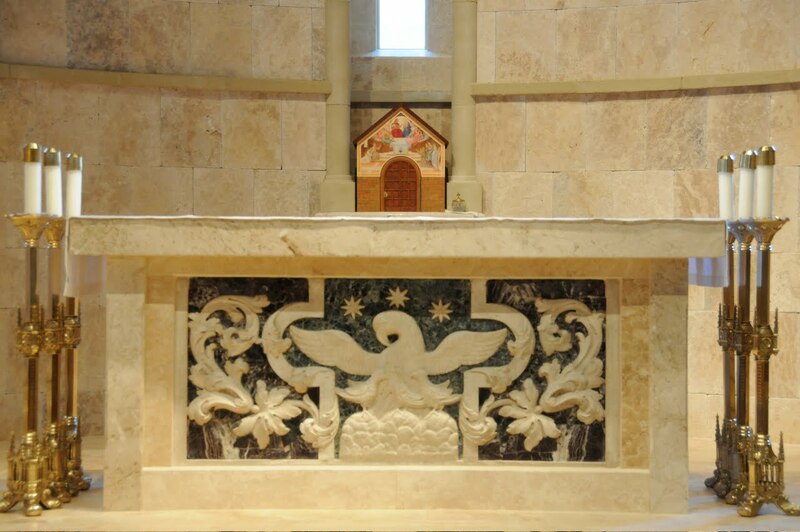 The tabernacle design, which was crafted specially for this chapel, is modelled after the Portiuncula chapel found in Assisi. 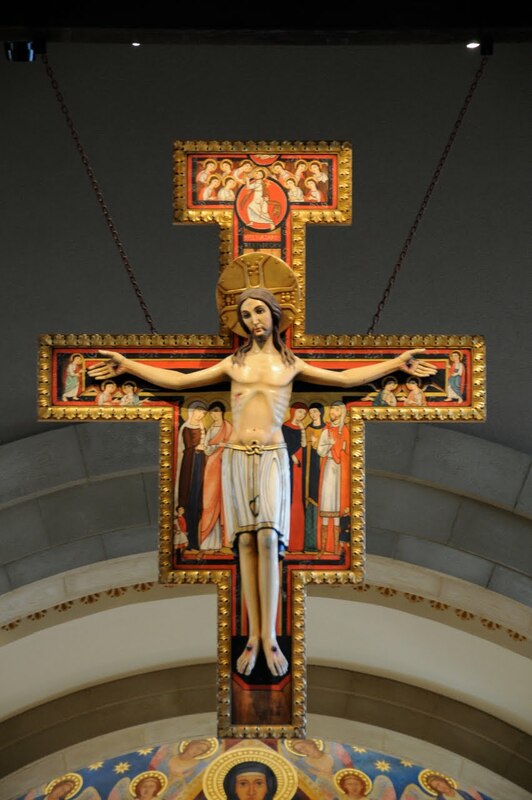 The cross, which is suspended high above the altar, while exactly modelled after the San Damiano crucifix of course, is not a mass-produced or industrially produced replica; instead, it was instead crafted by Demetz artisans, a family of craftsmen from the Tyrolean region of Italy. A few words about the fresco in the apse. It has a strength and depth of colour which ought to be emulated in my estimation. Speaking personally, I certainly far prefer it over the pastel tonalities that were so popular in the Victorian period of church design in North America. 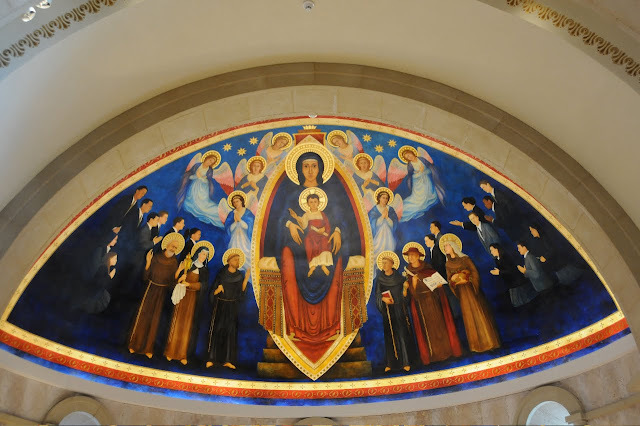 The fresco depicts the Mother of God holding the Christ Child of course, surrounded by St. Padre Pio, St. Clare, St. Francis, St. Anthony, St. Bonaventure and St. Elizabeth of Hungary. One will no doubt note the young men and women in formal, modern dress which further surround these figures; these represent the students of St. Anthony's, dressed in the uniform of the school. This would not have been easy do successfully and is a rather daring inclusion, but in this school context particularly and with the dominant traditional iconography of Christ, the Mother of God and the saints so clearly in the foreground, from what I can see I think it works. As noted above, the fresco was designed by an art teacher of St. Anthony's, Jennifer Baldwin-Schafer, assisted by 70 student apprentices; students of the school. The acoustic created by the stone, wood and marble is especially conducive to the Gregorian Chant provided by the Gregorian Schola. This was evidenced at the Dedication Ceremonies in September 2008, which were solemnly accompanied by the ageless strains of the chant. 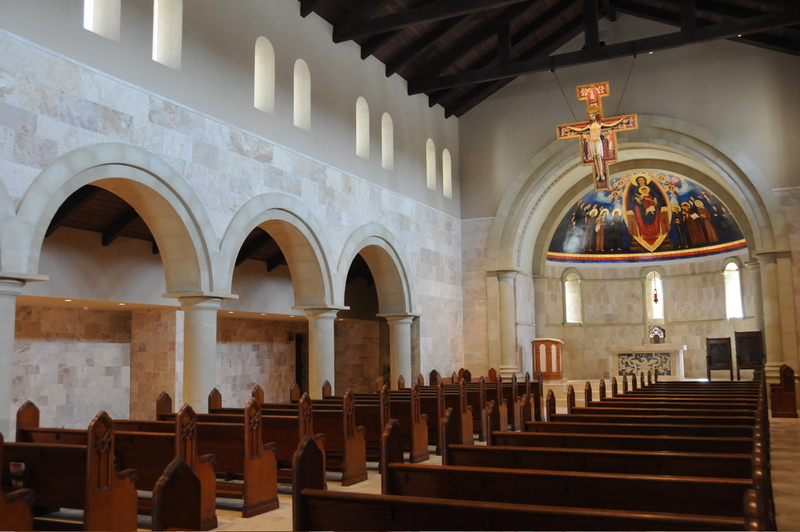 It is good to know that the school has not only endeavoured to design and build a chapel of this sort, but is apparently also pursing other traditional liturgical aspects such as Gregorian chant. If I were to give one recommendation, it would certainly be to consider adopting the use of the "Benedictine arrangement" rather than placing the candlesticks around the altar, thereby giving further prominence to the altar, while also emphasizing and assisting in the proper orientation of the sacred liturgy.